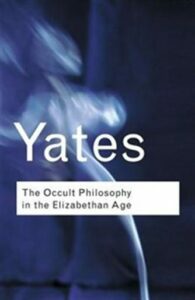 For anyone interested in occult philosophy, the books by Dame Yates are absolutely essential – and The Occult Philosophy of the Elizabethan Age is no exception. First published in 1979, Yates covers a broad range of topics and key thinkers to show how fundamental occult thinking was during this time period. Yates focuses on the formation of the Christian Cabala as it was adapted from Jewish circles by Pico della Mirandola shortly before the Jews were expelled from Spain in 1492. Hebrew Kabbalah developed in Spain with the publication of the Zohar around 1275. Pico combined Jewish thought with Hermeticism to pave the way for future Christian Cabalists like Agrippa and Dee and even influenced much of Shakespeare’s works. The word means ‘tradition’. It was believed that when God gave the Law to Moses he also gave a second revelation as to the secret meaning of the Law. This esoteric tradition was said to have been passed down the ages orally by initiates. It was a mysticism and a cult but rooted in the text of the Scriptures, in the Hebrew language, the holy language which God had spoken to man. Out of Cabalist studies of the Hebrew text there developed a theosophical mystique, nourished on elaborate search for hidden meanings in the Scriptures, and on elaborate manipulation of the Hebrew alphabet. Cabala was basically a method of religious contemplation which could, rather easily, pass into a kind of religious magic, though such a use of it was actually a degradation of its higher purposes. The book is broken into three parts. Part one provides a very broad overview of the Occult Philosophy in Renaissance and Reformation. Yates starts with a treatment of Cabalistic elements in Ramon Lull’s artwork and then delves into the adaptation of the Christian Cabala by Giovanni Pico della Mirandola and Johannes Reuchlin. She notes how Renaissace Neoplatonism was incorporated and how later writers including Francesco Giorgi and Henry Cornelius Agrippa created their philosophy and world view based on these principles. What’s interesting is that Agrippa, whom Yates portrays as a strong Christian Cabalist, would later be demonized around the late 1590s-early 1600s, as James I and his witch craze supporters grew more powerful. Even today Agrippa and his contemporary, John Dee have reputations as conjurers and black magicians, which was hardly the case during the time period in which they lived. She also shows how famous German artist, Albrecht Durer, may have incorporated Agrippa’s philosophy into his Melencolia I piece. the dominant philosophy of the Elizabethan age was precisely the occult philosophy, with its magic, its melancholy, its aim of penetrating into profound spheres of knowledge and experience, scientific and spiritual, its fear of the dangers of such a quest, and of the fierce opposition which it encountered. She begins with the highly influential John Dee, who is known in modern magical circles for his system to summon angels. Dee was a very well respected Renaissance scholar in Elizabeth’s court. Like Agrippa, Dee experimented with a magical system and eventually summoned (or at least thought he summoned) angels. To these Christian Cabalists, what they were doing was protected from evil entities precisely because they used Christian Cabala to interact with higher realms. The sensational angel-summoning side of Dee’s activities was intimately related to his real success as a mathematician. Like the Christian Cabalists generally, he believed that such daring attempts were safeguarded by Cabala from demonic powers. A pious Christian Cabalist is safe in the knowledge that he is conjuring angels, not demons. This conviction was at the centre of Dee’s belief in his angelic guidance, and it explains his pained surprise when alarmed and angry contemporaries persisted in branding him as a wicked conjuror of devils. Unfortunately, Dee’s opponents became more powerful, and even as he tried to appeal to James I to clear his name later in life, it was to no avail. He died in poverty and his negative reputation stuck – so much so that when Christopher Marlowe wrote his famous play, Dr. Faustus, Dee is associated with Dr. Faustus – the wicked conjurer (and student of Agrippa) who signs away his soul to Mephistopheles for knowledge and power. Yates also speculates that many of Shakespeare’s works were inspired by Christian Cabala. Around the time she published her book, another scholar named Daniel Banes had published a critique of the play, Merchant of Venice where he associated each of the characters with a branch on the Sephirothic Tree. Shakespeare was also known to incorporate ghosts, demons, and fairies into his writings – many of which could be interpreted in light of time period’s occult philosophy and its opponents’ counterattack. Finally, in the third part of the book, which is quite short, Yates equates Christian Cabala with Rosicrucianism and gives a brief overview of how John Milton and his brand of Puritanism may have been influenced by Agrippa. My main criticism with the book is that the first part is not as clearly explained as the second and the third is so brief that the topics she covers are little more than random thoughts (which, of course, she does justice to in other works). Perhaps this is because John Dee is one of her favorite subjects to talk about, while everyone else gets a muddled overview. My other gripe with the book is that there are several places where she seems to write as if she’s thinking out loud rather than arguing a cohesive framework. Regardless, the overall product provides a great overview of Elizabethan Occult Philosophy as it was coming to light back in the late 1970s. Her book is fundamental to occult philosophy studies and does a great job of packing a lot of information into a 250 pg book. I highly recommend it for anyone interested in understanding the history behind Christian Cabala or looking for an alternative view to the modern wicked reputations of Agrippa and Dee.